In the last post, we talked about using rackable panels to install your fence on a slope. Pre-Assembled rackable panels definitely make the job easier, but they are not always practical. 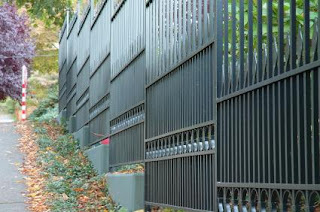 First, they are not available for all fence types and styles. Second, rackable panels can only adjust so far. If your hill is angled by a larger degree than your fence panel will rack, you have to use a different installation strategy called stair-stepping. Stair stepping is a fence installation technique where each successive panel in your fence line is installed higher (or lower) than the last; creating a stepped look. This is accomplished by either custom routing your fence posts to fit the height of your panels or by using brackets attached to unrouted (blank) posts. The panels themselves require no adjustment. As you can see from the illustration above, one drawback to stairstepping is that it creates gaps underneath your fence panels. If that is an issue for your application (ie. keeping children/animals in or out), there are a couple of ways to fix it First, you can build a solid barrier or use wire mesh to stop animals and children from crawling through the crack. The second solution is to actually create a concrete step under each panel so that the ground underneat is flat. (See the photo above). If you are pouring concrete under a stair-stepped aluminum fence, then you will use a post mount or welded bottom plate to attach the post to the concrete. As we mentioned in the introduction, sometimes stair-stepping is the best solution to installing a fence on a slope. It is also the only choice when installing one piece cast fence panels or panels that are welded together; neither of those are rackable. Or, it may simply be that you like the look of a stair-stepped fence; it can create an eye catching visage around stonework, landscaping, and pools. A common question that homeowners and do it yourselfers have when planning a fence is "How do I install my fence on a slope". We talk briefly about this in our DIY Fence 101 Guide, but the number of inquiries that we receive on this subject means that we need to explore it a little deeper. Fencing a sloped yard can be one of the most challenging fence projects that a Do It Yourselfer, or a professional installer for that matter, can undertake. Luckily, many pre-fabricated fence panels, like ornamental aluminum, steel, and vinyl are designed to be Rackable, which makes the task much easier. What is a rackable fence panel? A rackable fence panel is a panel that can adjust to follow the slope of your yard. 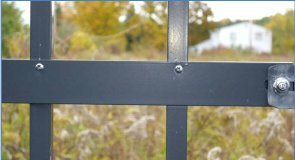 Whereas standard fence panels have a profile that is rectangular, with rails that run perpedicular to the pickets and posts, a rackable panel's profile looks more like a diamond. The drawing below illustrates the difference between a standard ornamental fence panel and a panel that has been racked. When installed on a slope, the rails will still run parallel to the ground, but the pickets will no longer be perpendicular to the rails. Signet Fence sells rackable, pre-fabricated vinyl and aluminum fencing online. Below are the links to the product pages in our online store, as well as the amount of rack that you can expect from each fence type. Rackable White Vinyl Privacy Fence - racks up to 7 inches per 8 foot section. Can be installed on a slope of about 7 degrees. Vinyl Panels can also be cut to enable further racking. Rackable Residential Aluminum Fence - rack up to 20 inches per 6 foot section. Can be installed on a slope of up to about 28 degrees. Rackable Commercial Aluminum Fence - rack up to 8 inches per 8 foot section. They can follow a slope of about 8 degrees. Whatever fence material you choose, it should be a system that is pre-assembled from components as opposed to one that is cast or welded. Solid, one piece fence panels have no moving parts and cannot adjust to the angle of your hill without stairstepping, which we will cover in the next post. Consult the fence manufacturer's documentation to see if a particular system racks enough to fit your needs before purchasing. If the thought of digging post holes, hauling dirt, and pouring concrete makes your back hurt or has you thinking twice about the DIY part of your DIY fence or deck project, Oz-Post post support anchors are what you need. Oz Post support anchors are driven into the ground with a sledgehammer (for smaller jobs) or an electric jackhammer (which can be rented at most large hardware supply stores) eliminating a lot of the pre-installation prep work and allowing you to focus more on laying out your DIY project. [more] They are also more forgiving. 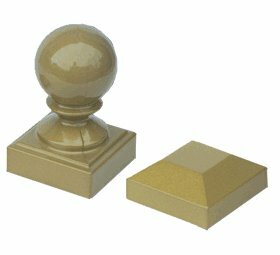 Posts screw into the Oz-Post anchor, so if you make a mistake, or if your installing a temporary item like a sign, you can unscrew the posts, pull the Oz-Post out of the ground, and use it again. Sometimes digging post holes is the better option, like if your installing posts more than 8" in diameter or if you want to punish your children for stealing the car. For the most part though, Oz-Post drivable post anchors will get the job done with less work, time, and possibly even less money. In part 1 of our pool safety blog post, we gave you a checklist of 10 things that you can do to protect your family and pets from accidents around your swimming pool this summer. In this second part, we are going to talk about pool safety fences, specifically what they are and what important features you should be aware of when installing one. A pool safety fence is a fence that is designed to make it difficult or impossible for infants/toddlers to gain access to your swimming pool without adult supervision. You might be thinking, "Isn't any fence that I put around my pool considered a pool safety fence"? And the answer is no. For example, a fence that can be easily climbed over or a fence with a gate that remains open will offer very minimal protection. To ensure that a fence provides an acceptable level of safety, an organization named the International Code Council (ICC) developed a set of pool barrier codes which define a set of minimum standards that a pool fence should meet. The International Codes, or I-Codes, published by ICC, provide minimum safeguards for people at home, at school and in the workplace. Many states and municipalities use the ICC codes as their local codes, but some provide additional restrictions. Always check with your state and local building departments to see if they differ from the ICC Codes. If they do, then you should follow the local code. This discussion assumes that we are talking about fences because they are the most common type of pool barrier. Technically, however, a pool barrier doesn't have to be a fence. 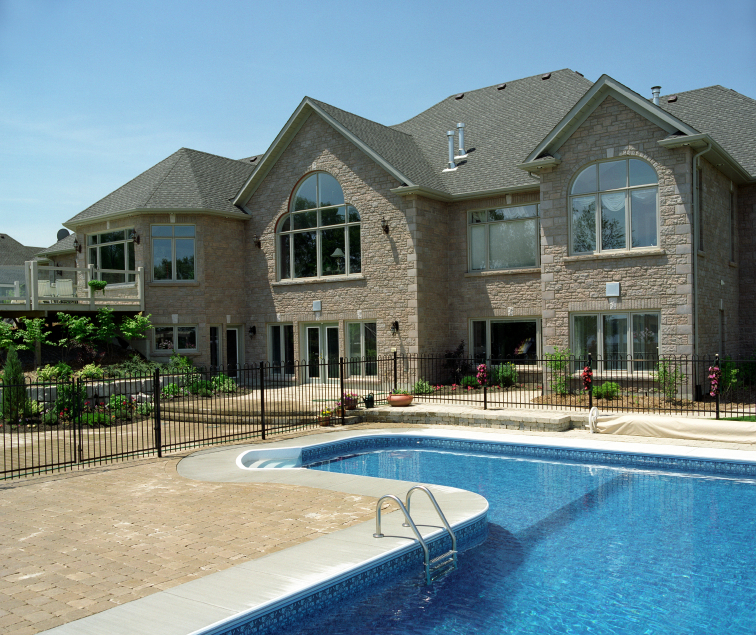 For example, a brick wall can be a valid pool barrier as long as it meets the ICC Building Code requirements. We've also put together a beginner DIY Pool Fence Guide which summarizes the ICC codes in more depth and contains several helpful illustrations. The following is a summary of some of the most relevant ICC Residential In-Ground Pool Fence Codes. It is not a complete list. For more information about the ICC or to purchase a copy of the complete ICC Codes, please visit their website at ICC.org. A Pool Fence should have a height equal or greater than 48in. A Pool Fence should not allow an object greater than 4in. in diameter to pass through its openings. A Pool Fence should have a gap no more no more than 2" from the bottom rail to the ground. 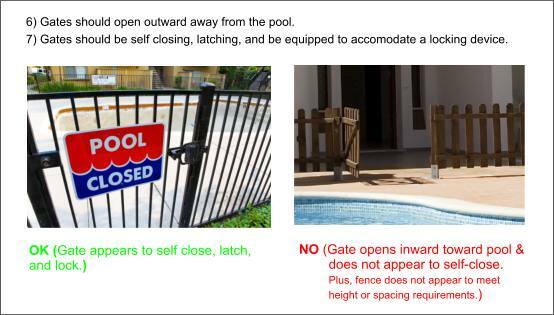 Pool Fence gates should be self closing, latching, and be able to accomodate a locking device. The following images can be used to visualize some of the ICC pool fence codes. They show a fence that exhibits the proper features next to one that does not. Swimming Pool Safety Part 1: 10 things (in addition to a pool fence) that you can do to keep family and pets safer around the pool this summer. Although you wouldn't know it from the cold spell that we've been having in the Northeast, Swimming Pool Season is right around the corner and now is as good a time as any to review your pool safety plan. As a supplier of fences, of course we think that a proper pool safety fence is extremely important, but its only one part of a comprehensive strategy for safeguarding your family and your pets from pool related accidents. So, in this post we'll discuss 10 other pool safety steps and save pool fences for the next post. Much of the advice in this post is summarized from the various content sources on the Consumer Product Safety Commission Website. Maintain Active Supervision When the Pool is in Use - There is no substitute for active parental supervision when the pool is in use. Accidental drownings can occur in the minutes and seconds that parents: receive a phone call, step away to use the restroom, or answer a knock at the door. One solution is to team up with another adult so that one of you can step away and still maintain supervision. Children under 5 should always be kept no more than arms length when in the swimming pool area. 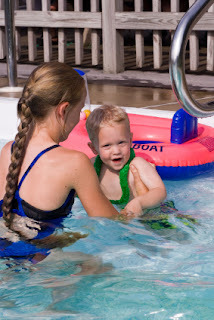 Teach Children How to Swim at an Early Age - According to Swim America, a child can be exposed to swim lessons as soon as they are capable of independent motion (as early as 6 months). They do not exactly learn how to swim at that age, but they do learn how to surface, roll over, and call for help. Lock Doors and Windows Leading to the Pool - If your home provides direct access to your swimming pool (ie. through a sliding patio door, etc), you should always keep the doors and windows locked to prevent children from gaining easy access. Swimming Pool Safety Alarms - There are many types of alarms that can be used to safeguard your pool; from standard alarms on pool entrances to floating sensors that sense disturbance in the water of your pool and will sound if a person or animal falls in. For added security, make sure that the alarm is clearly audible inside the house. Use a Pool Safety Cover - A pool safety cover can protect pets, children, and even adults from accidentally falling into a swimming pool. Make sure that your pool safety cover meets the weight requirements set forth by The American Society for Testing and Materials (ASTM) standards. Above Ground Pool Ladders Should be Locked or Removed When the Pool is not in Use - If your above ground pool comes with a ladder that can be removed, remove it and store it in a secure area when the pool is not in use. If the ladder can not be removed or locked up, surround it with an ICC and Local Code compliant barrier. Read our Pool Fence Guide for more information about code compliant barriers. Keep Rescue Equipment By the Pool - In a drowning emergency, seconds can make the difference. Keeping rescue equipment, such as a shepherds hook and life preserver, close to the pool can save a few of those seconds. It's also important to have a first aid kit near the pool for non-drowning emergencies like falls, cuts, and scrapes. Remove Toys From the Pool After Use - Removing toys from the pool will take away a powerful attractant for your infant or toddler. The less reasons that you give your child to venture into the pool area unsupervised, the better. Mark Depth Levels Conspicuously - Many serious injuries to both children and adults are caused by diving or sliding head first into shallow water and striking the bottom of the pool. Place depth markers where they are clearly visible and place no diving markers in shallow water. 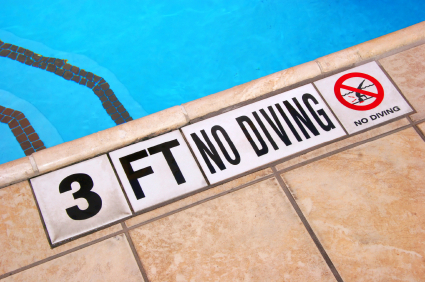 Also, work with your pool contractor to make sure that diving and sliding boards are placed only in areas of the pool that have a safe depth. Use an ASME/ANSI A112.19.8-2007 Approved Pool Drain Cover - This is a law since the 2007 Virginia Graeme Baker Pool and Spa Safety Act was enacted to prevent accidental drain entrapments and eviscerations. More information and a list of compliant pool drain cover manufacturers can be found at the link above. The above list is not exhaustive; there are many more safety considerations than are practical to cover in a blog post. For more information on swimming pool safety, check out these web resources. Also, talk to your local swimming pool professional for help devising a sound swimming pool safety strategy and to make sure that your pool is compliant with all local and national codes and laws. Our next blog post will cover pool safety fencing standards and best practices. Looking to enhance the safety of your pool? Check out the following products. If you browse our online fence supply store , you'll probably notice that the Regis Ornamental Aluminum Fences and Westbury Aluminum Railing that we sell feature an AAMA Verified Architectural Grade Powder Coat and a lifetime warranty to protect against fading, rusting, chipping, and cracking. 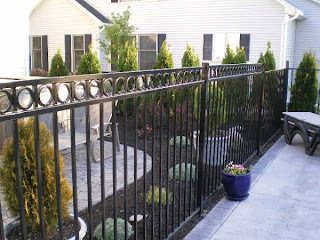 We think that this is such an important feature, yet some people might assume that this is the norm in the aluminum fence industry, it isn't, and we're going to tell you why you should care. So what if my aluminum powder coat isn't AAMA Verified? Would you buy a diamond if it didn't come with 3rd party certificate verifying its authenticity and quality? How about a used car without a vehicle history report? Then why would you buy an aluminum fence without a VERIFIED powder coat and a lifetime warranty to back it up? Industry standards and independent testing are an important way to establish a benchmark upon which to build trust in a product. They provide the definition of what's good, better and best according to an entire industry, not just a single company. And while they're not always perfect, 3rd party verified products that follow industry standards can provide an enhanced sense of trust and reasonable expectation of performance. The two aluminum coating samples below underwent an accelerated weathering test equivalent to 5 years exposure in South Florida. 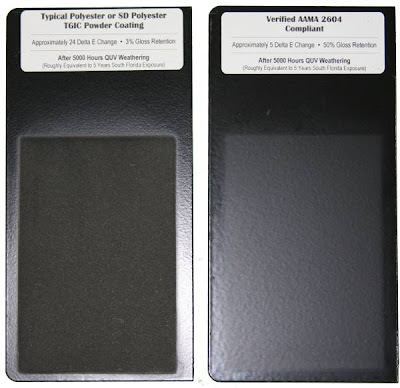 The sample on the left is a typical polyester powder coat commonly used by aluminum fence manufacturers. You can see that nearly all of the original gloss is gone and a significant amount of fading has occurred. 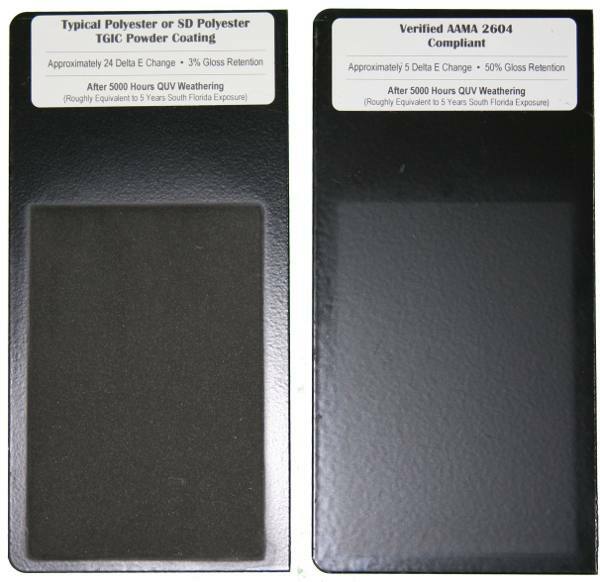 The sample on the right is the Verified AAMA 2604 powder coat used on Regis Aluminum Fences and Westbury Aluminum Railing. While some fading is visible, the sample still retains most of its original color and a much higher percentage of gloss . The AAMA (American Architectural Manufacturer's Association) is composed of companies that manufacture products used in certain residential and commercial building products like windows and doors. They establish a set of performance tests that all manufactured products must undergo if they wish to display the AAMA certification label. They also offer accreditation for 3rd party laboratories that want to perform AAMA verification services. There are 3 levels of AAMA coating testing: AAMA 2603-02, AAMA 2604-05, and AAMA 2605-05 listed in order from least rigorous to most. The testing requirements, which can be found here and on the AAMA website, are too detailed to list in this blog, but suffice it to say that they were designed to test that a coating performs (ie. maintains its color and gloss) to a measurable level when exposed to UV, weathering, and chemicals. Make sure that your fence doesn't turn into this. In summary, a high quality powder coat is the best way to ensure that your aluminum fence maintains it's color and shine for years to come; and, in our opinion, the best way to ensure a quality powder coat is to have it independently verified against the AAMA standards. 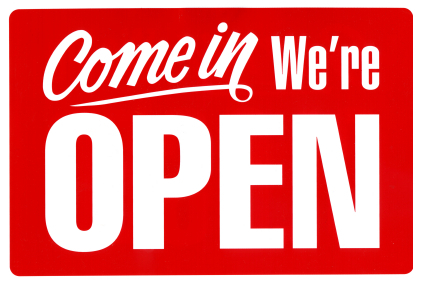 On behalf of the Signet Fence Team, I am happy to announce that our DIY Fence Supply Store is open for business and ready to become the #1 destination for all of your fencing needs. Selling fence supplies is nothing new to us; we've been a leading wholesaler to fence professionals since 1964. Now, we're using that experience to make buying fence supplies easier and more cost effective for homeowners and do it yourselfers. We already have a wide variety of aluminum fences and railings, tools, and accessories available; but that's just the tip of the iceberg. A Larger Selection of Fences and Fence Supplies. 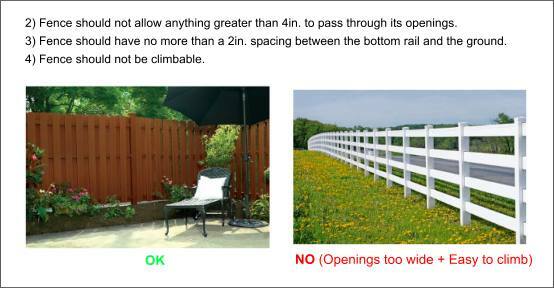 More DIY Fence Guides with user friendly illustrations. More Material Checklists for the fence and railing products that we sell. A Video Library full of building tutorials and design ideas. Of course, we'll take our cue from you, our customer's and community. If you have suggestions for new products, comments about how we can improve our site, or requests for new DIY articles, we'd be happy to hear from you.